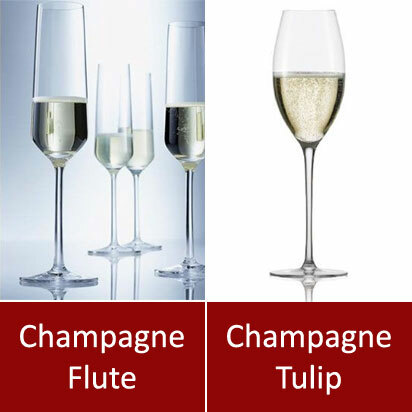 Difference between a Champagne Tulip and a Flute? The obvious answer is the shape. However, it appears it isn’t all about shape and form as you’ll find out below. The Champagne Flute, with its straight sides gives a more streamlined look but also offers a smaller surface area for your Champagne than the tulip. This is all very intricate as most servers would fill any type of champagne glass too full for the drinker to appreciate the fine aromas that the champagnes produce. The Champagne Tulip is quickly becoming the favoured one of the pair, but once again it is often filled too full. The tulip, with its far rounder shape allows the aromas to build in the bowl. One thing that happens, and we’ve all done it, is to smell the champagne the minute it’s been poured and quickly settled down. The mousse or bubbles are still sparkling and all we really smell is carbon dioxide. Let the champagne settle for a little while and then ‘nose’ it and the aromas and complexities will be far more rewarding than the earlier nose full of gas! Only fill the glass half full as this is far better to appreciate the champagne than a completely full glass. I personally prefer the rounder Champagne Tulip as the aromas offer so much more. It is even said that a lot of experts in the Champagne world are beginning to work their way from these two traditional glasses above to a more ‘normal’ wine glass shape as the bowls are so much larger and the aromas therefore get much more complex and beautiful. The adverse point of this is that an everyday wine glass will not have an effervescent point notched in the bottom of the bowl, as most champagne glasses do, to promote a seemingly never ending flow of bubbles. The easiest way to answer the question ‘What’s the difference between a Champagne Flute and a Champagne Tulip’ is to try your Champagne in both and take your pick! But remember, when you’re raising a glass to your next celebratory moment, you can impress your friends with a piece of very simple knowledge!